Are you reasonably intelligent? Do you like showing that off? Do you own a Sega CD? Have you tried Jeopardy! 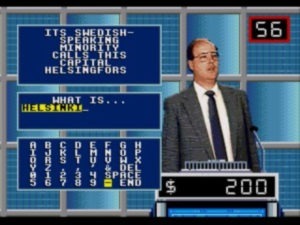 before in its 8-bit incarnations, and found yourself missing Alex Trebek’s smarmy Canadian attitude? Sony Imagesoft to the rescue! Admittedly, a multimedia version of Jeopardy! makes good sense, and Sony Imagesoft’s early attempts here would set the standard for future PC and next-gen console versions of the classic trivia gameshow. Gameplay follows what previous releases already established; you pick and name an avatar, play all three sections of the show exactly as they run on T.V., and use a virtual keyboard to type out your answers. The new additions for the Sega CD are the expected digital video that supports where it can, the presence of Alex Trebek in a limited capacity, and a full use of the CD format to store a vastly more impressive variety of questions than its cartridge predecessors. I love how he looks like he’s REALLY thinking here. Up to three players can participate in a single game, with the computer optionally available to fill in any empty slots. (Why you would want to play with less than three AI or human players escapes me, but the option is there.) Your characters are digital video clips of actual people acting as contestants. They smile and look appropriately happy, but your options are definitely lacking. There’s only one black guy, one Asian guy, and apparently Hispanics don’t play Jeopardy! at all. Though no group should feel particularly singled out – there’s only one white guy too, and he’s some dorky-looking porker with a receding hairline and an extra chin. The actors also talk, but no voices were recorded, so their mouths move silently. They appear to be saying things like “All right!” or “Thank you!” but again, having no voices makes this awkward and entirely pointless. Victory and defeat clips are limited to only one or two per character, and you’re forced to watch the corresponding one after every answer given while the score is adjusted. Thankfully, these are kept short. Unfortunately, you’re still stuck with a handful of characters to pick from; none of which you’d want to represent you. Alex is indeed in the house, but in a minimal role. He provides only the basics here: an intro to the show, some generic “…and the answer is…” setups, and the occasional “Correct!” or “No, I’m sorry” responses. He does not read the questions. He does not even introduce the categories. It’s a little disappointing, but as I recall, on par with his appearance in more recent Jeopardy! games. And as this would have been his first time showing up in a game, it was likely more impressive for fans at the time, but still a fraction of what he does on the show. Another nice feature is the use of the Sega CD’s internal memory. You have three slots for three different games. As you play, that slot is constantly updated without requiring manual attention. Should the power fail, or you have to leave and turn off the console, you can pick that game up from the last question when you return. Likewise, that slot keeps track of who won the last game, so two new players can go up against the “returning champion,” with their character and lifetime winnings intact. Very cool, and an awesome feature for families or regular competitors. Sure, Cindy looks like a regular Bradbury reader. The most noteworthy aspect of this version is that it is hard. Damn hard. It’s not that the questions are dated, because they rarely are – most pull from history and do not rely on “current” events. It’s hard because this is back from when Jeopardy! was a stuffy show for the chronically educated, and hails from the years when even a $400 question meant something. Pop culture rarely shows up. This ain’t the sports edition, or the Teen Tournament. I’ve played about seven times so far and haven’t encountered a single category about movies. Instead, this is general knowledge from the deepest depths of the encyclopedia and the furthest reaches of the globe. You won’t need to know a little about a lot. You’ll need to know a lot about everything. Yikes. Maybe I’m more “street smart” and less cultured, but these were far too obscure for me. Guess it’s time to see what classes are available at the local community college. As far as the mechanics go, there are some good choices made. 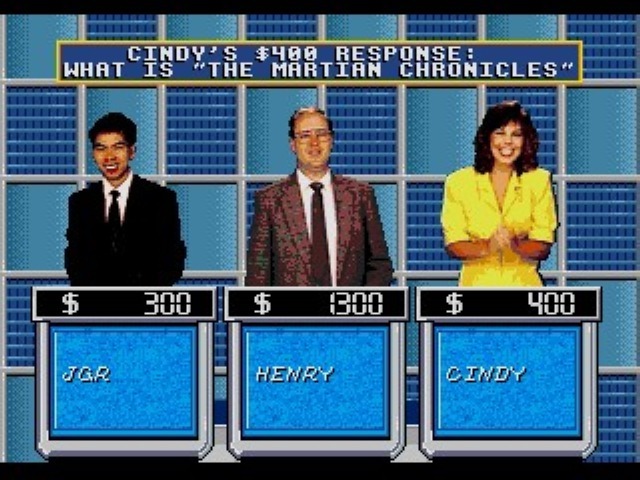 Unlike the NES version, there’s a delay after the question appears, allowing everyone a chance to read before ringing in. You then have plenty of time to hit your “signaling device” – 15 seconds once the clock starts – and plently of time to build your answer – a full 60 seconds. I never had an issue on either front. In fact, if anything, the game felt like it dragged on too long. The total game itself has no time limit, so you’ll answer every single question on the board. The lengthy response times are needed from a gameplay perspective, but definitely destroy the quick pace the T.V. show is known for. 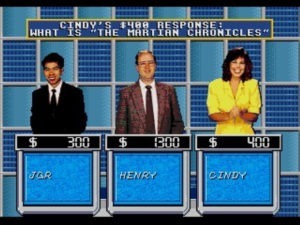 I suppose it might be different with three human players instead of simply waiting for the computer to clear out a category, but you’re going to want to devote 45 minutes to an hour if you intend to play both rounds and Final Jeopardy. As usual, spelling counts. I’m glad the game versions of the show are not multiple choice, but I do think it’s somewhat unfair to require you to spell precisely when that’s not a factor on T.V. Good luck with “The Order of the Chrysanthemum.” Shortcuts are likewise discouraged, so “Order Chrysanthemum” would not be permitted. You’ve got to type it all. This may be the reason you’re given the generous full minute to spell out your response. At least the limitations here mean he won’t patronizingly tell you each correct answer. Graphically, there’s not much to complain about, but not much to say. The set is still based on hand-drawn art (no digital stills of the actual studio), but it works well, and maintains the feel and color scheme of the show. The video has the Sega CD’s usual digital noise and deeply crushed blacks (see the lack of detail in the suits), but it’s not too distracting in this case. Video here is never used in a role critical to the gameplay. Sound is quality, but rarely gets the chance to show off. Much of the game is silent. What isn’t silent is taken directly from the show (like the Daily Double riff, or the “out of time” bloops) and naturally sounds correct. Voices are also clear and quality when they appear (though announcer Johnny Gilbert is noticeably missing from the video intro), and Trebek’s distinctive tone comes through clearly. You could say that the minimum amount of effort has been done, but I’m not sure what else you could expect out of a Jeopardy! game. It’s authentic, as it should be, and so won’t surprise anyone. Overall, it’s true to the show. 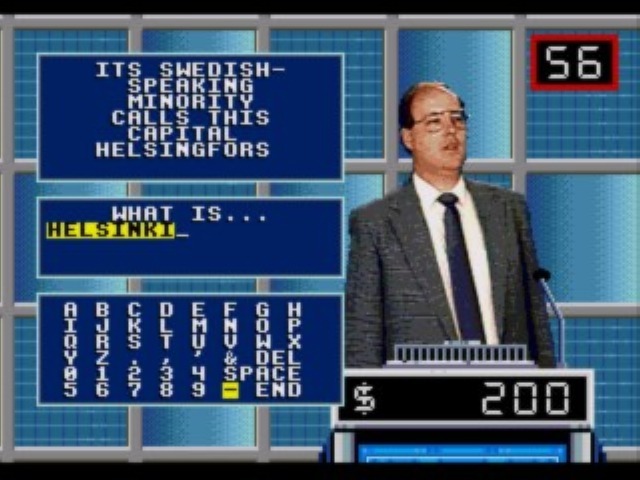 If you owned the Sega CD and watched Jeopardy!, this is a natural fit. It replicates an episode well, stores plenty of questions on the CD, and makes excellent use of the console’s memory for auto-saving. The multimedia capabilities are a bit underused; offering only limited clips of Alex Trebek and contestants. Questions still aren’t read aloud, and no considerations were given for video or audio Daily Doubles. Think of the disc as a very large set of new questions, with the same functional gameplay as previous video game ports, and some limited multimedia fluff. Adjust your interest accordingly. More questions than the cartridge versions. Plays well and auto-saves progress. Digital Trebek and sounds from the show add to the authenticity. Tough questions limit the accessibility. Limited use of the multimedia format.